I have QuickBooks POS 2015 (12.0) & I want to connect to QuickBooks POS using MS Access/Excel. I am unable to connect to QBPOS with Access and Excel 2016. Also, I am getting error "Internal error 160000" in MS Access. I am able to connect to QBPOS with VB Demo. Is there an issue with the most recent version of MS Office? This is known issue with QuickBooks POS SDK & Office 2016 and due to this Office 2016 is not able to connect to QuickBooks POS using QuickBooks POS Data DSN. 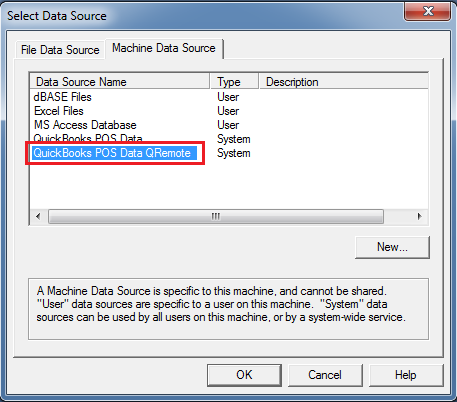 You can use QRemote DSN "QuickBooks POS Data QRemote" in MS Access/ Excel which does not have this issue. Please select QRemote DSN "QuickBooks POS Data QRemote" at the time of connection & you will be able to connect to QuickBooks POS 2015 (12.0) using Office 365 / 2016.